Xavier Musketeers forward Isaiah Philmore (31) shoots during the first half against the St. John's Red Storm forward Orlando Sanchez (33) at the Cintas Center. CINCINNATI (AP) — Justin Martin led a 13-point run that opened the second half and swept Xavier to a 70-60 victory over St. John’s on Tuesday in the tip-off game for the reconfigured Big East. One of the league’s newcomers beat one of its old guard with a dominant second half. The Musketeers also went 16 of 21 on free throws after not shooting one in the first half. Semaj Christon added 10 points and eight assists, and Isaiah Philmore had 11 points and nine rebounds. D’Angelo Harrison scored 21 for St. John’s (9-4), which is accustomed to coming to Cincinnati, but not to face Xavier. The Musketeers were added to the reconfigured basketball league while the University of Cincinnati moved to the American Athletic Conference. Seven Big East schools formed a basketball-only league and added Xavier, Butler and Creighton. Xavier and St. John’s had played only one other time, with the Red Storm winning 75-55 in 1981. Xavier is hoping to transfer its success at the Cintas Center to the new conference. The Musketeers have all nine games there this season and are 182-25 in 14 seasons at the on-campus arena. The Musketeers came out a little tight for their big moment in the new conference. Xavier missed its first 11 shots while St. John’s pulled ahead 9-0. All five starters missed a shot during the scoreless spurt, which ended with Matt Stainbrook’s putback at the 12-minute mark. The Musketeers went on an 8-2 run and evened it at 17-all on Philmore’s bank shot with 4:57 left in the half. Phil Greene IV hit a long 3 and scored a fast-break basket that put the Red Storm back ahead. The score was tied three times before Harrison’s four-point play — Dee Davis decked him as he shot from beyond the arc — let the Red Storm take a 29-27 lead into halftime. St. John’s was 1 of 3 from the free-throw line, which was better than Xavier, which was only 3 of 12 from beyond the arc, not getting to the line. 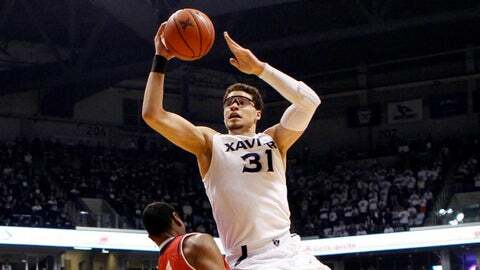 Martin led the 13-0 run that opened the second half and put Xavier up 40-29. The forward hit a 3-pointer that gave the Musketeers their first lead, then had a putback, a steal and a layup and a driving layup during the run. The Red Storm missed its first seven shots in the half. Harrison had a pair of pull-up jumpers during a 5-0 spurt that cut it to 48-44. The Red Storm couldn’t get closer than four points the rest of the way. Stainbrook scored inside, and the Musketeers made seven straight free throws while rebuilding the lead to 11 points and holding on. St. John’s Chris Obekpa blocked four shots. He led nation with 4.03 blocks per game last season, setting a school record for a freshman.